The daily cleaning of your teeth not only prevents infection and tooth decay but also removes stains and keeps your smile white and bright. There are many different types of cleaning methods available in order to keep that winning smile in top condition. Some types of cleaning can be performed as part of your daily routine and some will be performed when you take your regular visit to the dentist. When it comes to the various types of cleaning available for your teeth, the dental hygienist should be top of the list. The hygienist’s top priority is the cleaning and polishing of your teeth after the dentist has performed their regular examination. The hygienist may also be able to perform tasks such as placing protective sealants on the teeth and will be able to give you the best advice on keeping teeth clean and healthy. The hygienist may also be able to perform more complicated cleaning procedures such as a deep cleaning. Deep cleaning is an advanced, thorough type of treatment whereby a cleaning procedure is performed below the gum line. This treatment can be performed either by an experienced dental hygienist, the dentist, or in some cases a periodontist. The treatment is often used in periodontal maintenance to eradicate plaque and prevent infection from periodontal disease. It consists of scaling and root planing; this is the process of removing deep plaque below the gum line, and the smoothing of the tooth root so that plaque will have less of a chance of reattaching itself. Deep cleaning is not usually recommended for a routine cleaning but may be needed for patients who have not visited the dentist in many years. It may be performed under some form of sedation as the removal of deep plaque can be difficult for some patients. Once the usual cleaning and scraping of plaque has been performed, the final step of polishing the teeth can take place. Dentists or hygienists will use a polisher that they are comfortable with, but the instrument will usually be a high-speed air polisher or a rubber tipped polisher. Polishers can also use a high pressure water jet to eradicate any traces of plaque left on the teeth and gums. The result will be smooth feeling teeth that will look bright and feel healthy. Dentists and hygienists agree that at home dental care is one of the most important aspects of good dental health. Brushing your teeth twice a day, combined with flossing, is the only way to help prevent infection and tooth decay. There are numerous appliances that can be purchased in order to aid at home dental care; disclosing tablets, mouth washes, polishers, high speed electric toothbrushes, and water irrigators. These dental appliances will all help keep teeth and gums healthy, but if you do not brush and floss teeth twice a day, you are risking tartar and plaque build up, and then serious tooth decay. Along with brushing, flossing is one of the most important types of cleaning of the teeth and gums. Flossing removes bacteria, plaque and particles of food from between the teeth and gums. Many people simply brush their teeth without using floss, but flossing is vital to get at the places that a toothbrush cannot reach. Dental floss now comes in a wide variety; thin, thick, waxed and flavoured. There are special flossing machines that can be bought, and you should try a variety of flosses in order to find your ideal type. 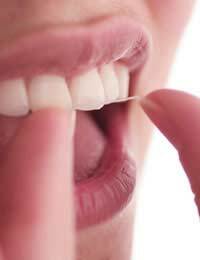 Flossing is a major factor in the prevention of periodontal disease and should not be forgotten about. The huge variety of toothpastes now available can be bewildering, but all that is really essential to keep teeth clean and healthy is a good quality, fluoride toothpaste. Fluoride helps prevent cavities and can even aid in filling cavities in the teeth. They are many types of toothpastes specifically designed to make the teeth whiter, but many will contain harmful abrasives that can wear down the enamel of the teeth through prolonged use. Be wary of dental whitening kits that can be bought as these will often contain harmful abrasives or acids that can also damage teeth enamel and gums. Everyone loves to have healthy, clean teeth, and the types of cleaning instruments that can provide this has grown considerably over the years. Find the toothbrush and cleaning products that suit you best and then adhere to a daily dental cleaning routine and you will be left with a smile you can be proud of.